2. Mix all the dry ingredients together in a bowl (panko breadcrumbs, Parmesan cheese, seasoned salt, garlic powder, basil, black pepper). 2. Pour the milk into a separate bowl. 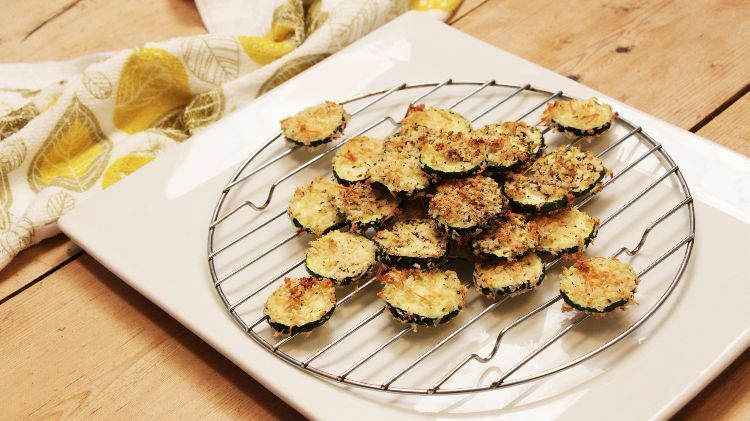 Dip the zucchini slices in the milk, coating each side evenly. 3. Bread each zucchini slice with the breadcrumb mixture, covering each side evenly. 4. Place all the breaded slices on an oven rack lightly coated with cooking spray. Bake for 30 minutes, or until crispy. Pro tip: Dip the zucchini chips! Try with garlic hummus, muhammara or aioli. Pro tip: Add spices to the breadcrumb mixture for different flavors. Try smoked paprika or cayenne pepper for a kick. Oregano actually does wonders when paired with zucchini.